As we know the motorcycles began together as a new platform with the naked Duke set to precede the sports bike version, the RC into the market. 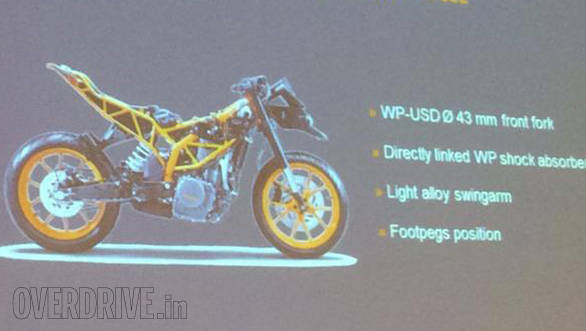 But as KTM points out throughout the press materials, a lot has changed in the time between the conception of the Bajaj co-developed low-cost entry-motorcycle platforms. 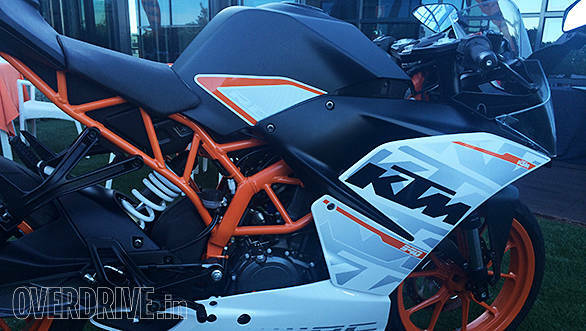 The KTM RC 390 is based on the same platform as the Duke, but there are a lot of differences. The RC 390 engine itself is the same oversquare (89x60mm bore-stroke) 375cc single with DOHC four-valve single that powers the Duke 390. Peak power is listed as 44PS at 9,500rpm (European specification) and peak torque is 35Nm at 7,250rpm. Top speed is well north of 170kmph, KTM Street Development head Sebatian Sekira says he hit 175kmph. The big difference to the powertrain tuning is actually the gearing of the motorcycle. The official spec sheets lists primary drive as 30:80 while final drive is listed at 15:45. Contrary to what was told to us earlier, the RC does not differ from the Duke in terms of changes in the gearing or the gearbox. The higher top speed (we tested the Indian 390 Duke to a 168.5kmph (actual) and 172kmph (indicated)) is coming from the better aerodynamics of the fairing in the RC. The information in the media documentation is scanty but the clear plastic form of the top fairing - which cleverly makes the motorcycle look slimmer than it is - as well as the oddly industrial shape of the large front mudguard suggests that this bike was actually tuned to slip through the air as quickly with as little drag as reasonably possible. Allow me to quote Sebatian directly - my comments are in square brackets. "Frame geometry - steering head angle. Suspension - less travel front [down to 125mm from 150mm] and completely different setting. 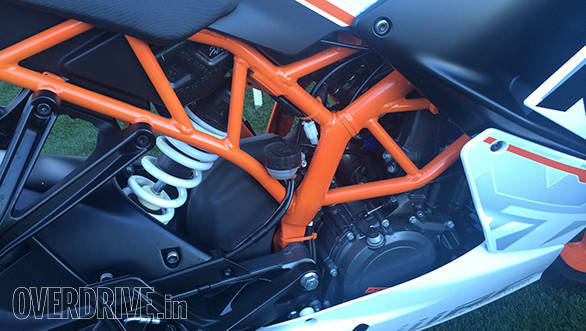 [India continues to get a softer damping setup based off this European, stiffer setup, just like on the 390 Duke]. Packaging - to prove the seat position and fairing, many parts got new positions in the motorcycle structure[ - E-E parts, tank, subframe design]. Ergonomics - longer tank, footpeg and handlebar position, new pillion seat concept. And the front mask structure [as in top part of the fairing] contains the dashboard, fairing [the surround on the dashboard] and mirror fixations." 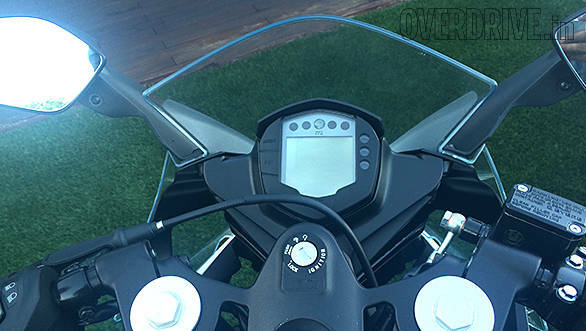 What he has left out is that the steering geometry is sharper (66.5 degrees versus 65 degrees for the 390 Duke). Trail is lower - which should mean greater agility and less resistance to changing direction- and so is the wheelbase, 27mm lesser than the Duke's at 1340mm. With a 75kg rider, weight distribution is 49-51 (front-rear) on the RC 390, compared to 46-54 on the 390 Duke, according to KTM. With a dry weight of 140kg and weighing 160 kilos on a full tank, the RC 390 is light, but not as light as the Duke. The power to weight ratio of the RC, though, is claimed to be the best in the below 600 class. The Duke 390 and the RC 390 have different roles and KTM is clear that it does not intend to make motorcycles that are all things to all people. In that sense, we expect the RC 390 to take a stand. Billed as the sportiest motorcycle in the segment, the RC promises to be sharp and fast but comfort and ride quality will not be priorities for the RC - this you can see in the low clip-ons as well as the shorter front suspension travel. Personally, I have always found role-focussed motorcycles to be more rewarding to ride than versatile motorcycles that do it all. Even when you are using the motorcycle to ride in conditions which it was not designed to handle. 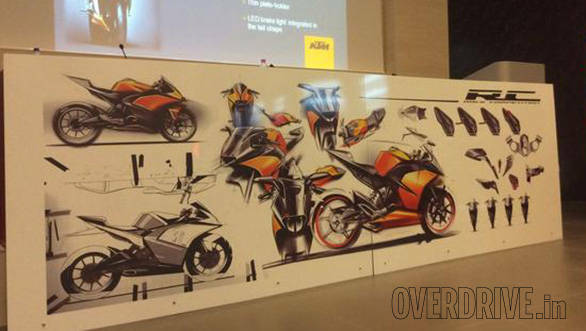 Next, watch for the riding impression of the motorcycle from the launch in Modena, Italy.